The only known example of Japan's second Serio-Comic map. Unlike Ohara's map, which was issued one month earlier during the Siege of Port Arthur, this map postdates the siege by nearly a month. Here the Russian Octopus has been replaced by a gigantic yellow weeping tree with tentacle-like roots extending into Europe and Asia. Japan, from its island stronghold, hacks at Russia with a mighty axe, chopping at its roots and yielding serious damage in the vicinity of Port Arthur. Throughout Europe and Asia Japanese flags and Japanese's Imperial Naval ensigns are being waved in celebration of the Japanese victory. The exceptions are Germany, which as a Russian ally is waving the Russian Naval ensign, and Denmark, which waves a Swiss flag indicating neutrality. China claps its hands and childishly sticks out its tongue in the direction of Russia. How poor riotous Russian! Bat he dont now himself influence and disordinately at another state to work house-breaker. This time he is occasion of hopelessness to exist. Because, at the Oriental he now are to repeat tear-war and tear war. He ally and all another stete to reject riotias and accusable. The all world generally state are at Japan to bring mercy deep compassion. Long Live! Long Live!! Our interpretation is that the author wants to suggest that Russia, having been defeated by Japan, is suffering an existential crisis. This was indeed the first time in modern history that a European power suffered a major defeat at the hands of an East Asian power. The victory over Russia at Port Arthur cemented Japan's position as a world power and forced European powers to reevaluate their own position in the world. The defeat also cost Russia the respect of its allies and subject states, potentially inspiring others to stand against the giant. April 1904 – Kisaburō Ohara – A Humorous Diplomatic Atlas of Europe and Asia. 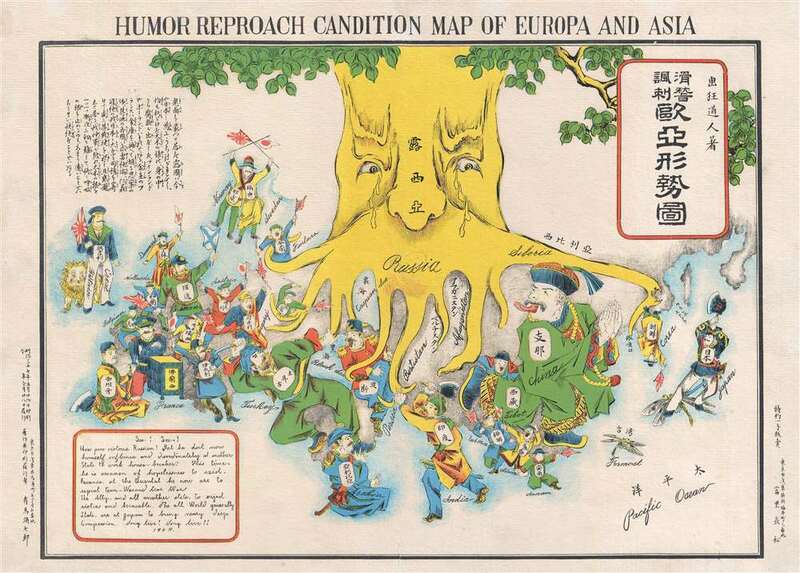 May 1904 – Unknown – Humor Reproach Candition Map of Europe and Asia. June 1904 – Kamijo Yomotaro – New Comical Atlas. January 1905 – Unknown – Asia Europe Zanshin Kokkei Chizu. The map was printed on May 24th, 1904, and distributed on May 28th. This map is exceedingly rare. There are no other known examples of this map. Owned jointly with Boston Rare Maps. Very good. Professional restoration at fold intersection. Blank on verso.